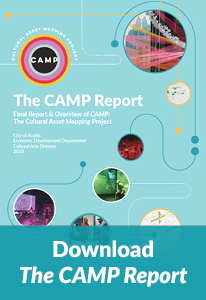 Conducted in the summer of 2016, CAMP visited each of Austin’s 10 Council Districts asking participants to map places that had cultural and creative value to them. With help from community members like you, CAMP compiled a directory of over 3,000 points depicting cultural assets like theaters, music venues, local landmarks, and more through district meetings, DIY CAMP mapping kits, and an online interactive map. Download The CAMP Report to learn more about how CAMP's data can be applied and to view the maps created with the community responses compiled. What's in The CAMP Report? As a complement to The CAMP Report, CAMP created Thriving in Place, a primer on place-based economic development for cultural spaces. Thriving in Place offers an introduction to cultural district planning and organization, and examples of site-specific strategies aimed at ensuring cultrual spaces and their surrounding communities may avoid displacement and thrive in place. 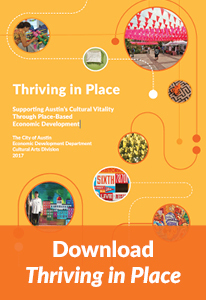 Download Thriving in Place to learn more about planning for cultural districts. What can you do with CAMP data? Through CAMP, we compiled a directory of over 3,000 entries of cultural facilities and resources as of 2016. The data collected through CAMP was created by the community for the community and we hope it will inspire you to create your own culture maps highlighting arts and culture in your district. Cultural asset mapping is an approach used around the world to collect citizen input about cultural resources and help communities articulate their community’s needs. Conducting your own CAMP project can serve as an important first step in organizing your community in support of the arts. Download The CAMP Kit for materials to use in your own mapping projects. To access or download the complete CAMP directory, visit the City of Austin Open Data Portal.